At Atlantis Damp Proofing and Timber Specialists, we understand how important plastering specifications are for a Damp Proof Course and will carry out all work to an exceptionally high standard and in accordance with the British Standard Code of Practice. Commonly after specialist treatments to your property, it is required to renew the wall plaster to receive the full benefit from the previous treatment made. Therefore, it is strongly recommended that when damp proofing your property, plastering is applied to the areas of concern. 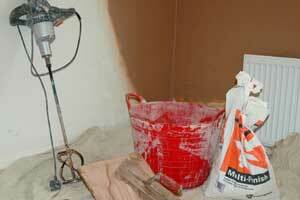 When treatments are applied to damp proof your property, they do not always dry out the wall. Instead, damp proofing treatments prevent further moisture from rising whilst still present in the wall or problem area. Therefore, if you are having any damp proofing treatments implemented in your property, securing the treatment with new plaster will remove the original signs of damp. It is very important you have a specialist assess the area to identify the correct damp proofing mix that will coincide with the existing chemicals in the wall or problem area. Our plasterers are the best in their field and will leave a no-mess, no-hassle job, ensuring that all work is of the highest standard and meets all of your requirements. At Atlantis damp, we have experts who can provide an excellent plastering service perfect following damp proofing your property. During damp proofing and plastering your property, our surveyors will fully investigate the causes of damp within and explore the suitable method of treatment before plastering. All of the results and feedback will be provided in a full written report, along with recommendations and details of the cost. We don’t confuse our customers with jargon and we give an honest approach regarding the assessment of your property to give you all the options available to you. We understand the concerns you may have when tackling aspects of your property and so we make sure our customers are fully aware of the process. If you need more information on our plastering and damp proofing services, our expert team will be able to advise you on the best action to take. Give us a call today on 0800 0988 277 or email us at atlantiscanhelp@gmail.com for more information.